ooh - Chuck Taylors! 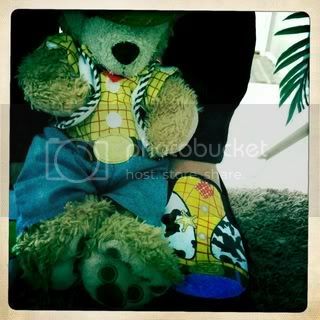 I love those shoes - I will have to hit Build A Bear this weekend too! Do they fit ok? My Duffy will be coming home today - I am so excited! I want to test out the preemie baby clothes to see how they fit. Still no Easter Bunny Duffy at WDW. It's funny, DL gets it in before WDW, that's a FIRST! Yeah the shoes fit good. Gotta squish his feet a little to get them in, but they look so cute on him! Now he can stand up better for photos! WDW FINALLY got Easter Bunny Duff in! Still no popcorn buckets and mugs though. Maybe they won't have them. I plan on picking up an Easter Duffy (and the sailor outfit) when I'm in Orlando in a couple weeks. Yesterday I saw a guest wearing the Duffy ears!!! Are they out now? Also with the release of Pirates coming up I hope they have a Pirates outfit for Duffy coming out! I thought the ear hats were supposed to come out at the END of April. Was at Epcot yesterday and didn't see any hats. BaB has a pirates costume. I've seen it at DtD and it's pretty cute. Yep! I usually look at Treasures in Paradise everytime I'm in the parks and the Duffy Ears are now available as of yesterday! They are $18 each. 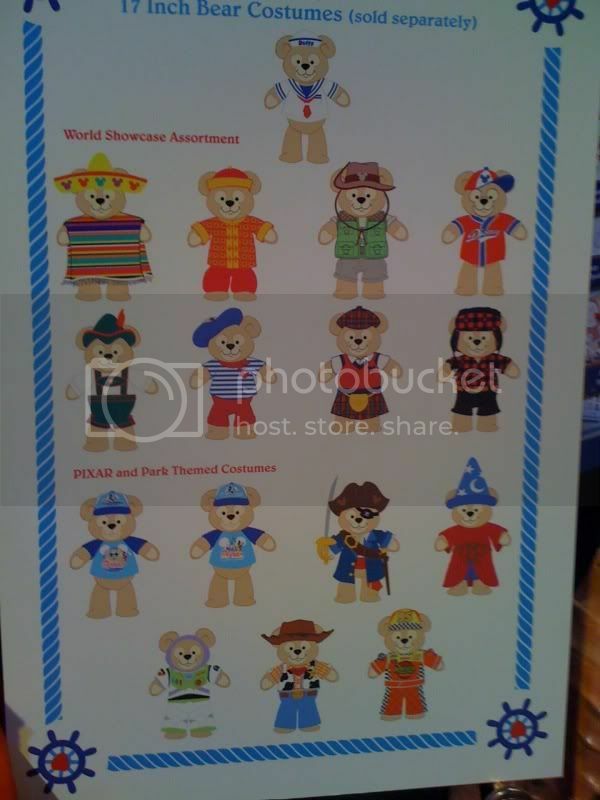 According to this, there will be a Pirates Duffy Outfit. I am SO psyched for the Sorcerer outfit. All the costumes look great. Just got back from Epcot and they have the ear hats. They had plenty! Had to get one, it's sooo cute! Just FYI, you can't do custom embroidery(in the parks) with those ears, the fur is too think and won't show up. It's buried under the fur. As of today the Duffy Store at Epcot were sold out of the Ear Hats. They said that they go fast! Any update on how long its going to be until that Graduation Duffy is made available? I keep reading a lot of reports lately that Duffy merchandise selling out. I certainly hope its not so EBAY users can sell them on to Japan. I would love to think that Duffy is finally starting to catch on with Guests in the US Parks. When I was at Epcot I saw a dozen people who had the Duffy ears on. They weren't just kids also! I wore mine and I had a lot of people compliment them. A few people asked where I got them. Haven't heard anything about the Grad Duffy so hopefully soon since it is coming up! They will probably have it out when Disney has their Grad Night thing. I hope I can find a Duffy ear hat when I visit DTD later this week. I plan on picking up an Easter Duffy and the sailor suit costume too. Btw, we got the Kilt and French(?) costume here in DCA. Sweet! I'll look at them this thursday!